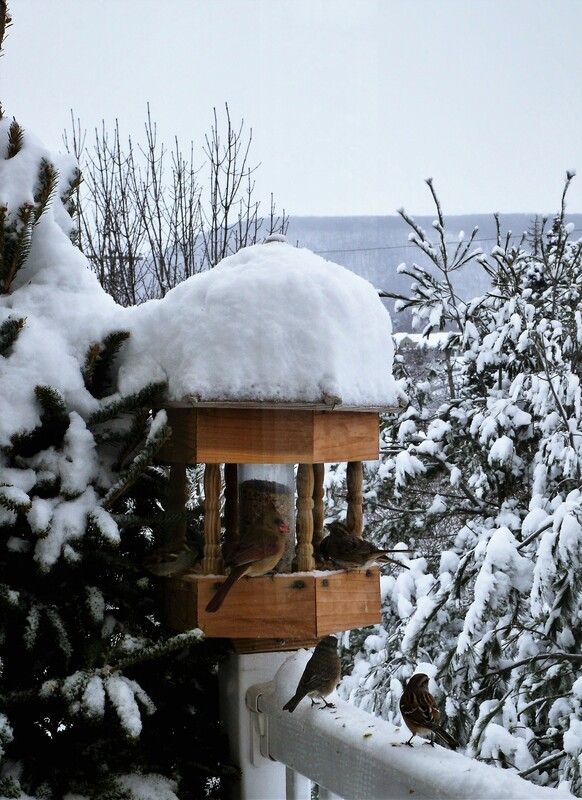 snow – Len Bilén's blog, a blog about faith, politics and the environment. 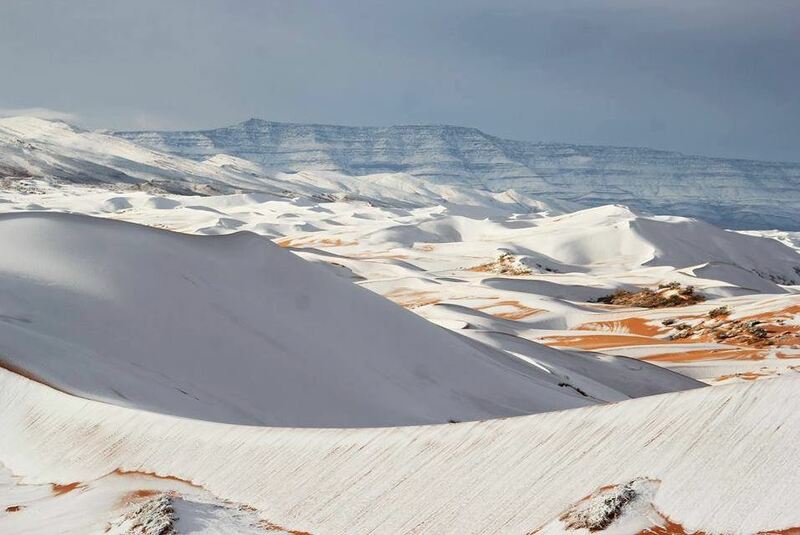 Third time snow in Sahara desert after 40 year absence. Up to 16 inches of snow has fallen on a town in the Sahara desert after a freak winter storm hit the area on Sunday. 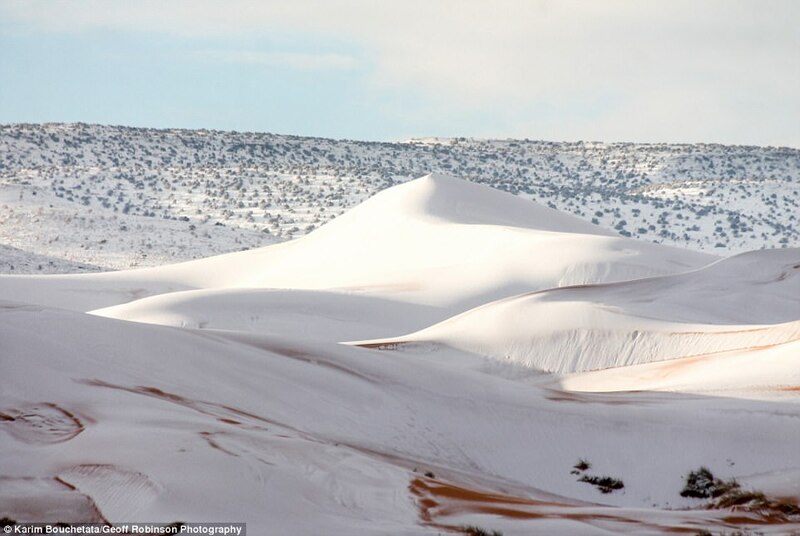 This is the third time in 37 years that the town of Ain Sefra in Algeria has seen snow cover the red sand dunes of the desert. Snow started falling in the early hours of Sunday morning Jan 7 and it quickly began settling on the sand. Does this mean global warming is ending and the beginning phases of the next Ice Age has started? No, not necessary, but it is a consequence of increased water vapor in the atmosphere. You see, in the tropics it is all regulated by the cumulus clouds and thunderstorms and the temperature of the oceans. If the oceans heat up ever so little, they release more water vapor into the atmosphere, and the amount of CO2 is of no consequence. All greenhouse warming is done by the water vapor, since you cannot absorb more than all energy available in the frequency band of absorption of the gas, and since in the tropics water vapor is counted in percent rather than parts per million as is the case of CO2. As the water vapor increases, clouds form and act as a strong negative feedback to keep the temperature stable in the tropics. Not so at the poles. 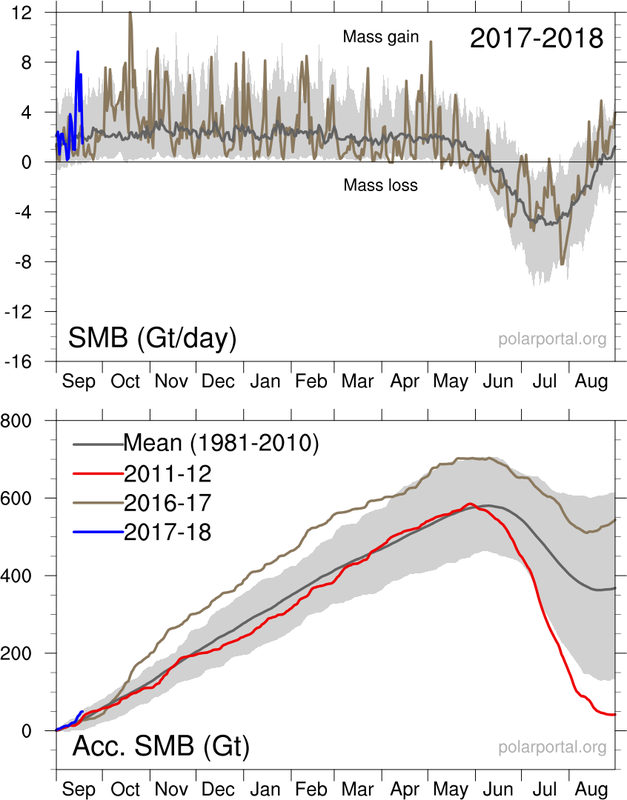 On Greenland and on the Arctic ice cap it snows more, and the increased water vapor leads to more storms coming up the Pacific and up the Atlantic. Some of them swirls back into Africa leading to these rare snowfalls. If it were not for the increased CO2, we would already be back into a new little ice age, but thanks to increased generation of CO2 the onset of the next ice age will be delayed by maybe a thousand years. Another good thing with more snow at the poles. The poles are getting warmer, and this leads to a smaller temperature difference between hot and cold regions, making for weaker storms, fewer tornadoes and hurricanes, less violent rains spreading over larger regions, all good. The snow comes earlier and earlier, but it also melts earlier. Blame China for that. They already use 47% of the world’s mined coal, and does not do a good job of cleaning up the exhaust gases despite their claims. Posted on January 15, 2018 Categories climate, CO2, environment, pollutionTags Ain Sefra, Sahara, snowLeave a comment on Third time snow in Sahara desert after 40 year absence. After over 40 years absence, snow in Sahara second year in a row! An end to the climate scare era? Return to the cooling Nightmarah? For the second year in a row there is a layer of fresh snow in the Northern Sahara desert! 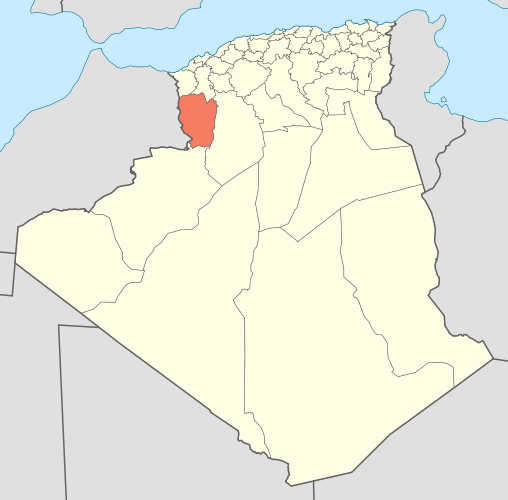 Aïn Séfra was sprinkled with some snow in December 2016, which was the first time that snow had fallen there since February 18, 1979, when a half-hour storm disrupted traffic. freak winter storm hit the area on January 20, 2017 dumping snow in the municipality up to three feet thick in some places. 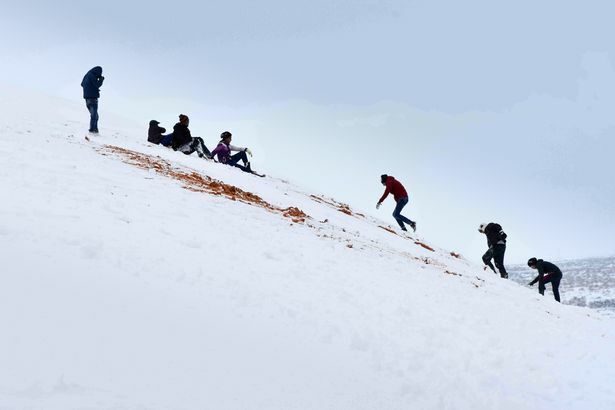 This was the largest snowfall in residents’ memories and had caused travel disruptions due to the roads becoming slippery with ice, while the resident children made the most of the situation by sledding on the snow-covered sand dunes and making snowmen. Posted on January 7, 2018 January 7, 2018 Categories climate, environmentTags Ain Sefra, Algeria, Sahara, snow1 Comment on After over 40 years absence, snow in Sahara second year in a row! 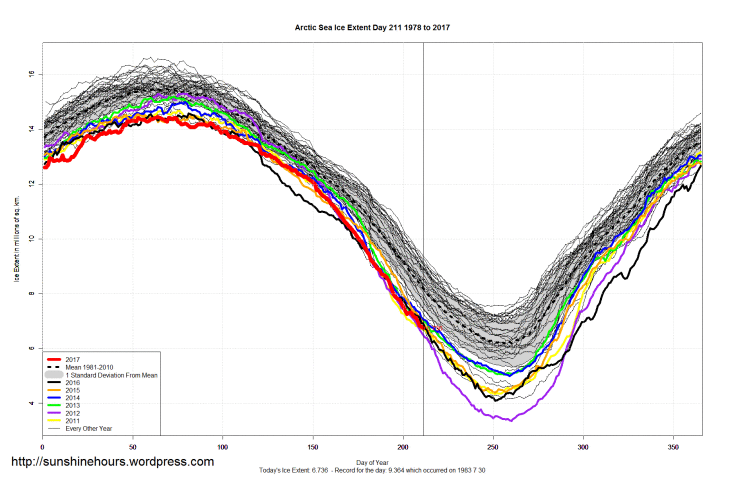 Arctic ice growing again. 8th lowest minimum this year. 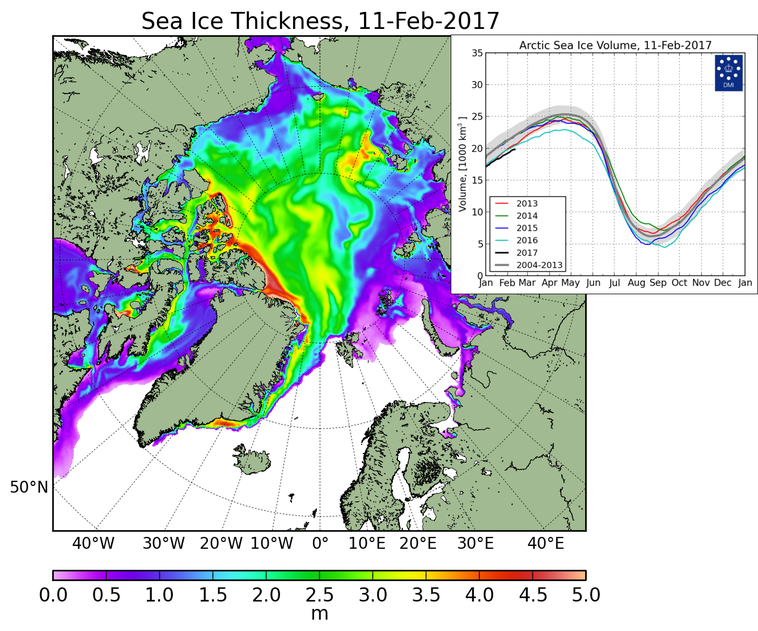 After a record warm winter in the Arctic last year leading to the lowest ice maximum, the ice melted at the slowest rate recorded, leading to the 8th lowest ice minimum. On Greenland the situation was quite different. It snowed and snowed, leading to the largest yearly ice gain recorded, which was quite a change from years and years of ice loss. Are these changes only temporary, or are they an early harbinger of the ice age to come? Posted on September 18, 2017 Categories climate, environmentTags Arctic ice sheet, Climate change, environment, Greenland, Ice minimym, snowLeave a comment on Arctic ice growing again. 8th lowest minimum this year. The great Arctic ice recovery of 2017. It was very warm in the Arctic above the 80th latitude last winter. Late summer two hurricane strength storms broke up a lot of ice up and transported it south to areas where it was bound to melt. 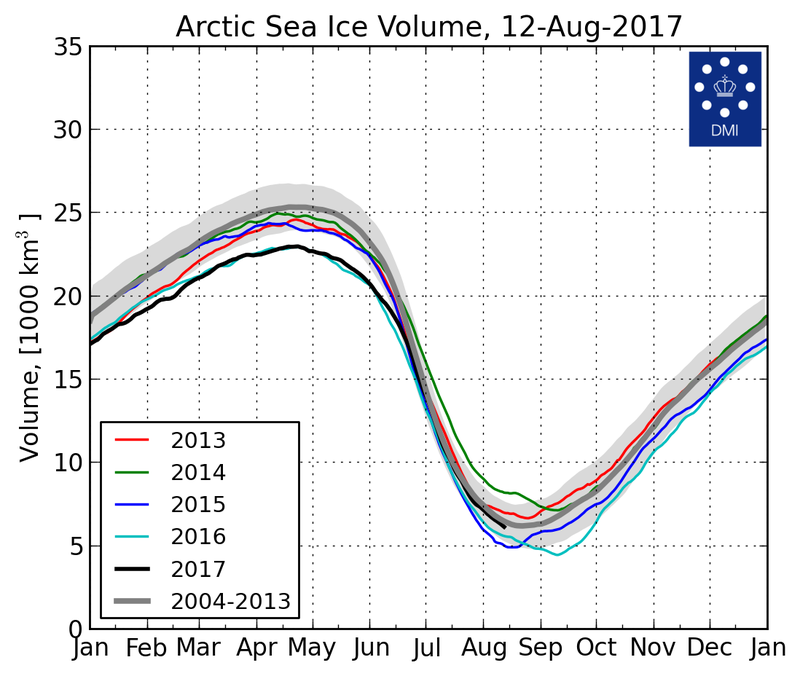 The ice area reached a new low, except for the year 2012, but the ice volume hit a new all time low on Sep 9 2016. Since then the ice volume has recovered to equal the previous all time winter low around April 20, 2017, but the ice area hit an all time low maximum as early as March 5. The unusually warm temperatures averaging 7 degrees C above normal with a spike as high as 20 degrees C above normal and no days below was not because of increased CO2, but because it snowed. Anyone that has shoveled snow knows that while it snows it is usually not that cold, especially if the winds are calm. Then, when the snowing stops it gets cold indeed. Nowhere is that shown better than what happened on Greenland this winter. It snowed and snowed from one winter storm after another starting in the Philippines, raining and snowing over California, regaining strength from the Mexican Gulf and then racing up the Eastern Seaboard snowing out over Greenland. Then on May 5 it all changed. 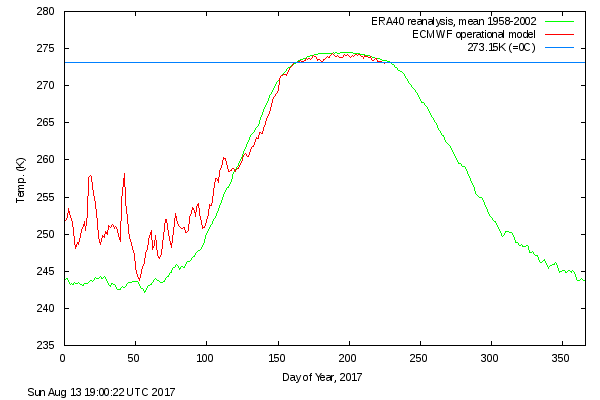 From having been warmer than normal the Arctic became colder than normal, in fact there has been no day since then that temperatures has been above normal. Today, Aug 13 it even dipped below freezing for the first time since summer max, five days before normal. 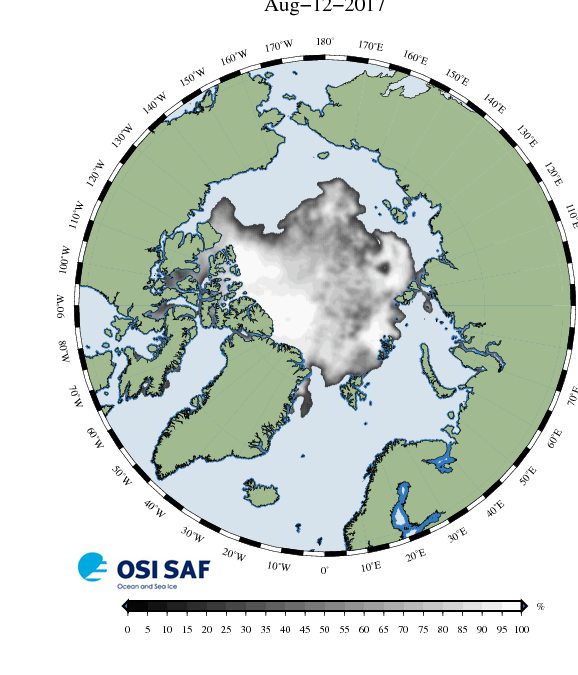 The ice area will still decrease for another month or so since sea ice does not start forming until temperatures are -4 degree C, but the ice volume is near its minimum since snow season in the Arctic has already started, and new snow on ice stays, and fresh snow has a higher albedo than old, tired ice. How much more ice? As of today the sea ice volume is 500 to 1000 km3 larger than last two years, not much, but enough to make a trend. 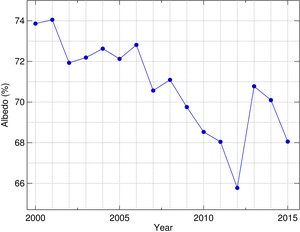 In addition the ice on Greenland has increased by 150 km3, reversing many years of decline. 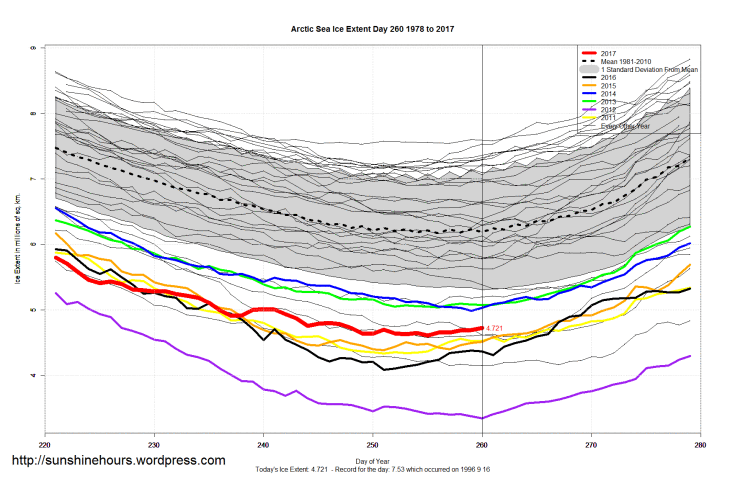 The prediction that the Arctic ice would be melted by 2016 was foolish extrapolation, but the chart looked good at the time. This year’s minimum will be about 6,000 km3. The moral of this story. Beware of extrapolations. Don’t trust models, go with observations. This year they could not have made the journey. There is not enough time left until the North West Passage freezes over. Posted on August 13, 2017 August 14, 2017 Categories climate, CO2, environmentTags Arctic ice sheet, Climate change, environment, Greenland, Polar Ocean Challenge, snowLeave a comment on The great Arctic ice recovery of 2017. On Climate Change. What can we learn from the snow? Having a snow day here at State College, and watching the birds feast on theseeds in the feeder, remembering the temperature was in the fifties yesterday my thoughts went back, way back to a time when I was trying to figure out why it was so hard to calibrate a temperature programmed gas chromatograph when analyzing samples from -40C to 275C. During the cryogenic phase water vapor froze on the inside of the oven, and when the oven temperature then rose through the melting point of water, temperature rise took a pause until all the ice was evaporated. As a result, calibration could vary widely dependent on the humidity and how long the oven was in the cryogenic state. The weather has been unusual this year. After a long drought the Pacific coast has been hit with a seemingly unbroken string of storms, carrying moisture all the way from the Philippines, resulting in record rain and snow. Likewise, in the Atlantic there have been a string of strong storms going from the Gulf of Mexico all the way up to Greenland or Norway, and the storms are still roaring. From time to time the temperature has been reported to be up to 30 degrees warmer than normal, and it has been raining as far north as Svalbard. 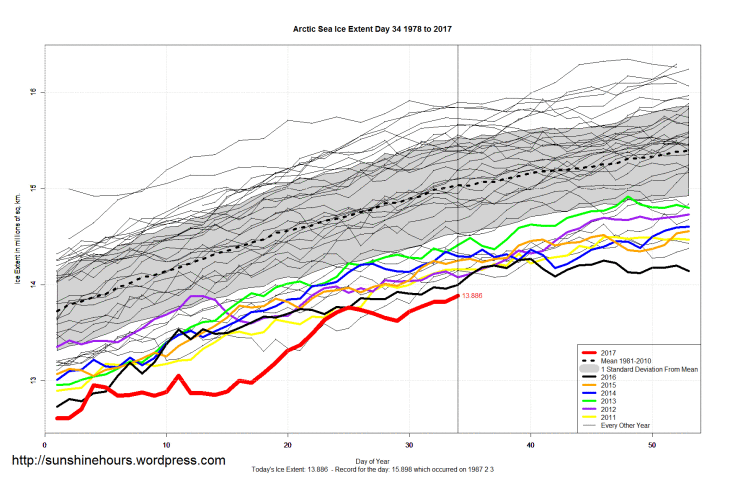 The charts seem to indicate that by September 2015 Arctic ice would be totally gone and all Arctic snow by summer 2014. Yogi Berra said: “It is hard to predict, especially about the future.” So how are we doing? 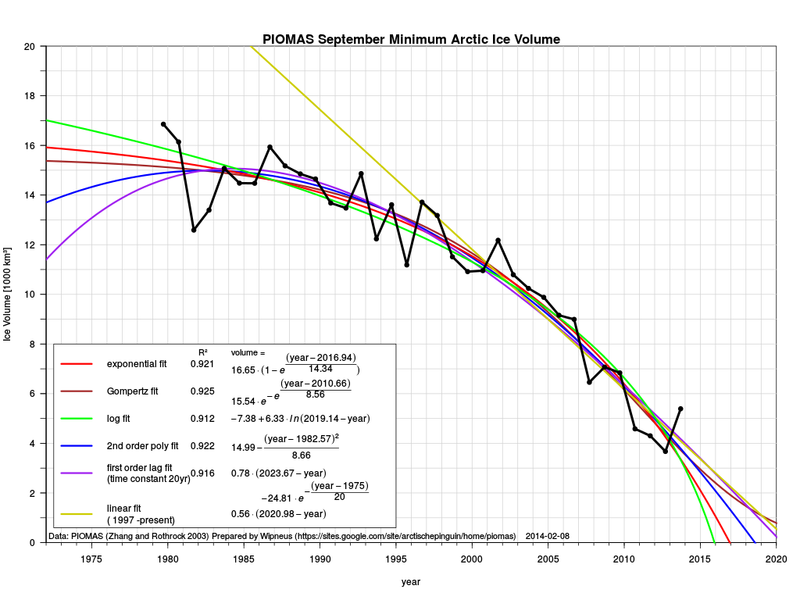 Arctic ice started out with the lowest minimum since 2012 and is still at record low levels for this time of the year. Couple this with the message that 2016 was reported the warmest year on record, and there seems to be plenty cause for alarm. But then it was reported by whistle blowers that the temperature data is homogenized to better align with climate models, in other words, falsified, so we may have to look for something that does not change over time, like temperature. 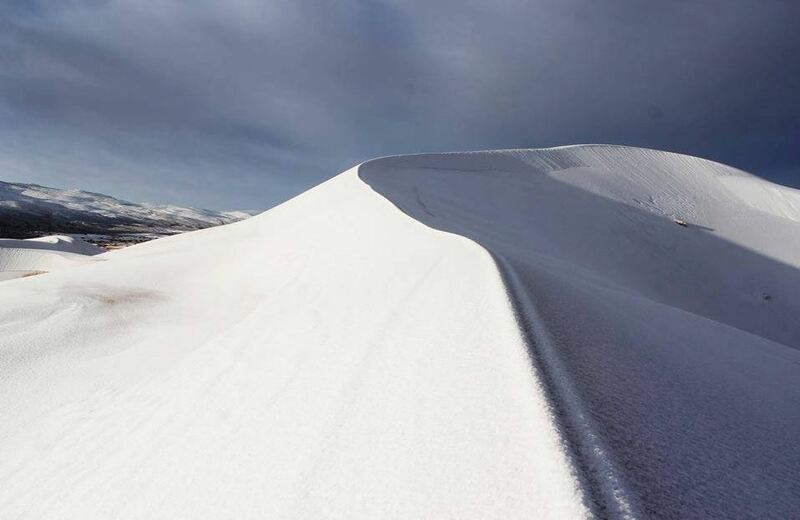 Snow and ice have the characteristic of freezing and melting at the same temperature, al long as there is no change in what else is in the snow or ice, like soot or salinity. With all this ice melting, what is happening to the snow? 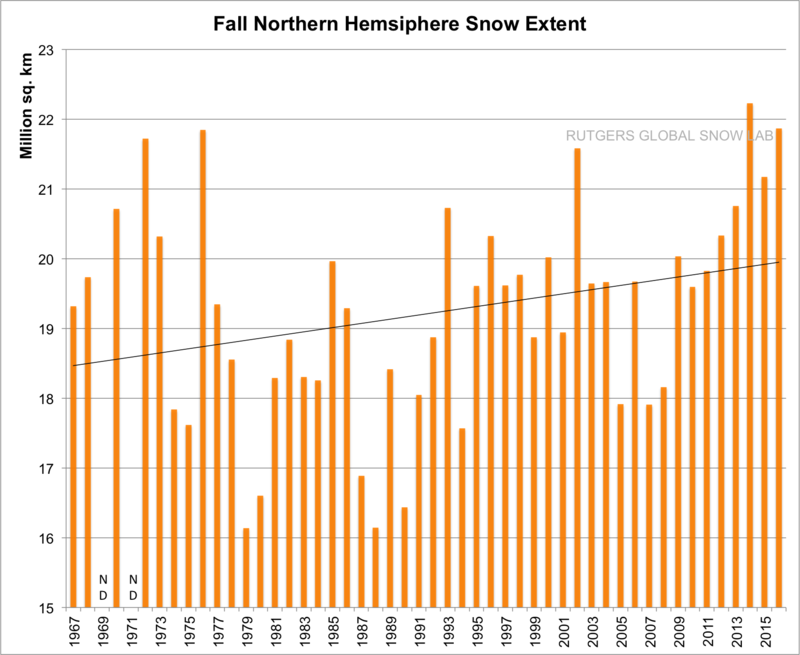 Checking Rutgers’ University Global Snow Lab ice charts it is clear that the fall snow cover is increasing, signifying an about 8% increase in the last 50 years, and surprisingly, a significant rise in the last 8 years. This seems to hint it is getting colder. 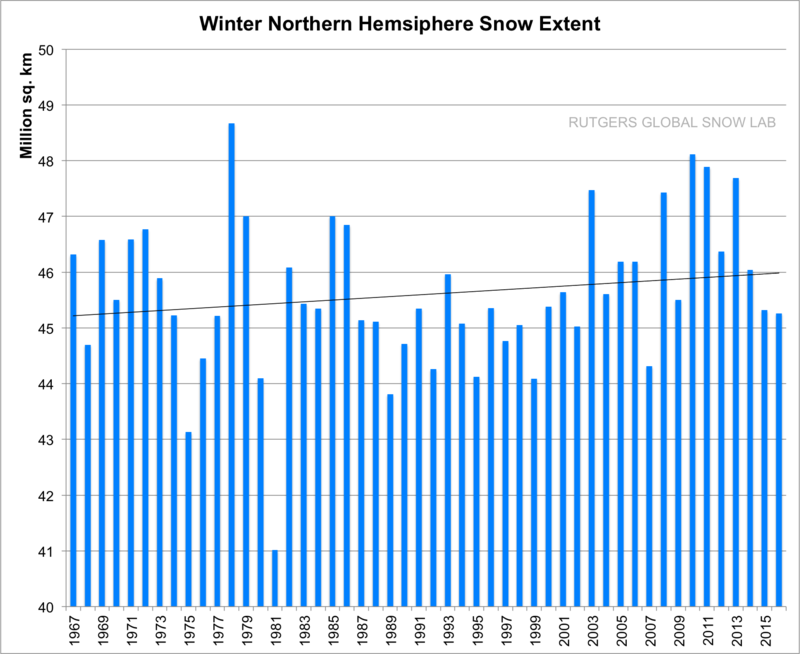 Not so fast: what happens to the winter snow cover? Again we see a slight upward movement, about 2% in the last 50 years. The January 2017 result are in, and the snow cover was the 5th highest on record for January, so the upward trend continues, indicating the climate is getting colder. But what happens in spring? 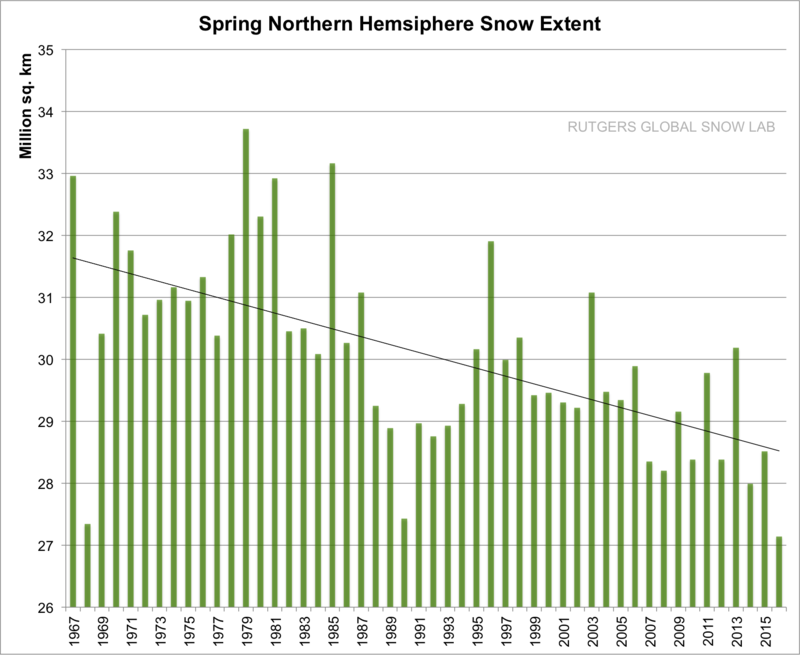 The story is quite different with the snow cover decreasing about 10% in the last 50 years. That must mean the climate is warming. Let us look at one more piece of statistics: The Greenland ice cover. This fall has seen a lot of snow falling over Greenland, about double of normal, much like the rain falling in California, the result of a string of storms starting in the Philippines, raining and snowing i California, snowing out in the Western states, recharging themselves with moisture from the Gulf of Mexico, and finally snowing out over Greenland or Norway. When the storms hit Greenland the temperature spikes, sometimes reaching 30F above normal, but it is still snowing! 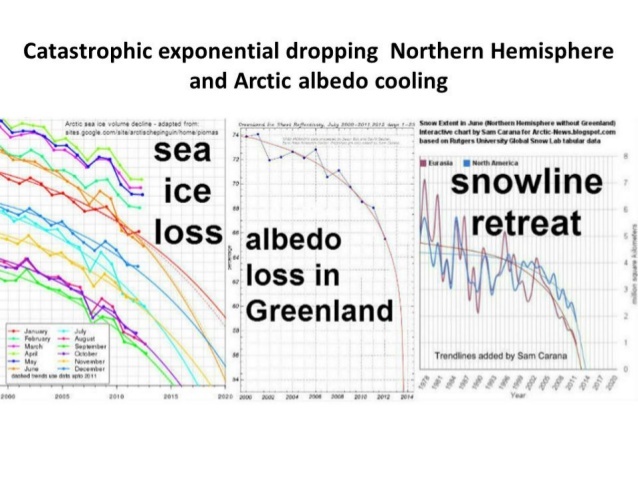 The albedo was constantly getting lower until 2012, and then it again snowed more than normal and the albedo recovered in 2013, from then continuing a downward trend. This year it will probably recover some more, leading to a year of ice gain over Greenland. Why is the albedo decreasing? Blame China. The last few years they have been building one dirty coal plant every week, spewing out soot and sulphur compounds in spite of their claim to have the best scrubbers. This is the reason for the earlier spring snow melt. The effects of increasing CO2 is mush less than the effects from clouds and what the clouds reflect back into the sky and what they carry in the form of water vapor. We are now seeing the result of the end of the el nino, the raining out of the excess humidity, which happens when the earth again is cooling. The 18 year pause is back, and is now 19 years. Posted on February 12, 2017 Categories climate, CO2, environment, pollutionTags Arctics, Climate change, CO2, environment, Greenland, politics, snowLeave a comment on On Climate Change. What can we learn from the snow? Three feet of snow in Sahara, a Limerick. The end of the Climate Change era? in the cold winters night. A snowstorm in desert Sahara. 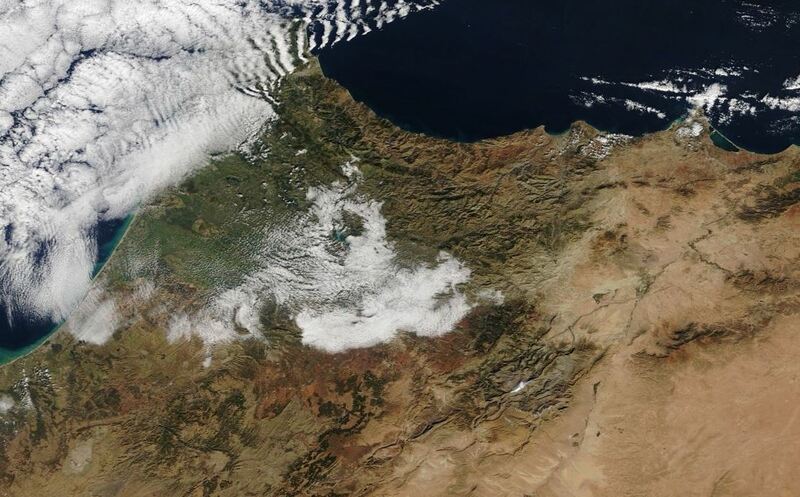 In December last year it snowed in Sahara, the first snow in thirty-seven years. Last night it happened again. This time more than three feet fell in some locations, and more snow is falling, and more is on the way. Posted on January 21, 2017 January 21, 2017 Categories climate, environment, limerickTags Climate change, Limericks, Sahara, snowLeave a comment on Three feet of snow in Sahara, a Limerick.